Q: How old are the bigger slash pine trees? A: Slash Pine in South Florida lacks data, probably because there is not a local lumber industry. However, Roy DeLotelle, a researcher for Red-cockaded Woodpecker habitat in Collier County, has collected data on the age of pine trees important for the woodpeckers. It comes from coring pines in the woodpecker’s habitat in Picayune Strand in Collier County. 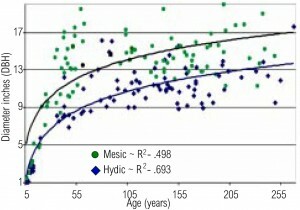 “average” line in the graph, so a tree’s diameter in DeLotell’s graph below may not tell the precise age. 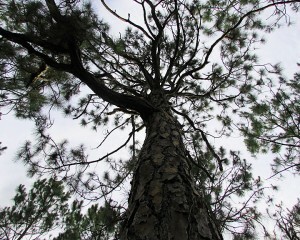 In the field, biologists use a different indicator of an “old” pine tree: a flat top shape to the pine canopy. In DeLotells’ graph of his data, DBH is the Diameter at Breast Height. The R-squared values show how well the line fits the data points. R-squared ranges between 0 and 1 with the higher number showing the line is a good fit for the data. Slash Pines can easily live past 200 years, and there are many that old in Collier County.